Whenever the word "corset" is mentioned in a historical context, it's almost always described as being "whalebone." Yet this is something of a misnomer: corsets – or stays, as 18th c. corsets were called – weren't stiffened with whalebone, but with another part of the whale called baleen. Baleen is the feathery, comb-like feature in the mouths of whales, screening and trapping food as they swim through the water. Baleen is made of keratin, a flexible material that's more akin to cartilage and fingernails than bone. But in the past, the definition - and the whale's anatomy - was blurred, and baleen and whalebone were used interchangeably. 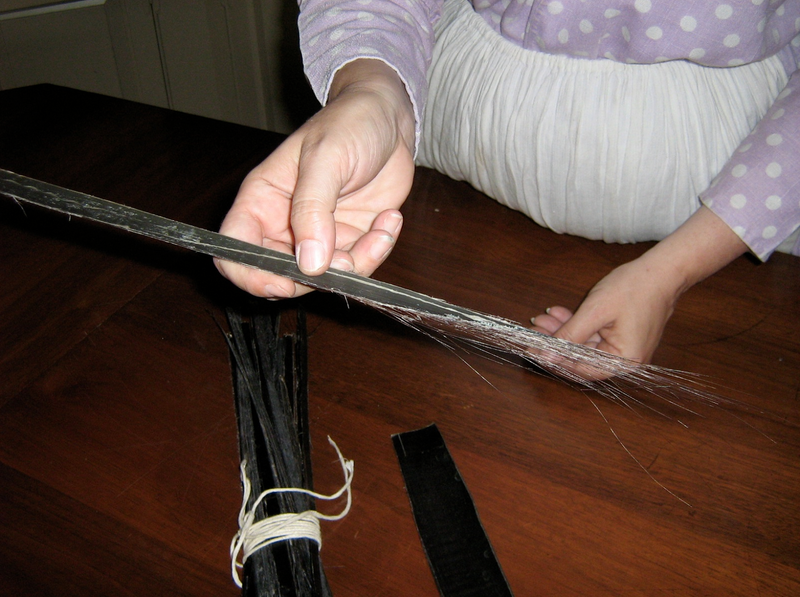 Baleen was harvested by whalers, and sold in strips such as those above left, on display in the milliner's shop in Colonial Williamsburg. As a material, baleen is strong and stiff but yielding, and can be cut, filed, and shaped. Many things that are today fashioned from plastic were made from baleen in the 18th c., including eyeglass frames, the spokes of umbrellas and parasols, and the blades of folding fans. became the fashion in 16th c. France and Italy, baleen was the stylish choice for the boning, or stays - the long, narrow pieces that were forced into the corset's vertical channels, and gave the garment its name. Baleen didn't crack like reeds or wood splints (other popular and less expensive options.) Baleen was strong and pliable, and it could be split to make the very thin stays that were necessary for sophisticated shaping. Stylish 18th c. stays were a work of art, or at least a work of very high craftsmanship and engineering. Here are a few examples: from the Boston Musem of Fine Arts, the MMA's Costume Institute, and the Victoria & Albert. There could be dozens of baleen pieces in a single pair of stays, each carefully cut, tailored, and finished to size. Nearly all stay makers were men, simply because few women possessed the hand strength necessary to force the baleen into the narrow channels. 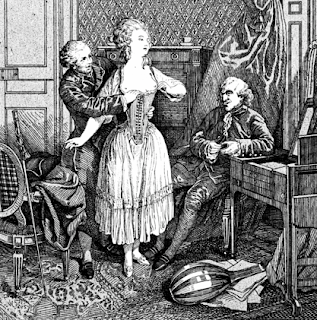 Of course, this also led to lots of salacious prints from the era, such as this one, lower right, with the leering corset maker fitting the young woman while another gentleman watches. Why do I doubt it's her husband? But by the middle of 19th c., steel boning began to replace baleen in corsets. Steel was equally flexible, but far easier to manufacture and use, and considerably less expensive than baleen. Just as the development of oil drilling and the petroleum industry in the 1850s spelled the end of the whale oil market, so, too, did metal corset stays do the same for baleen. For more information (and lots of photographs) about the sociology as well as the history of corsets, I recommend The Corset: A Cultural History by Valerie Steele. Interesting and informative as usual. As to the whale, however, I think there are nations on the planet that are not practicing conservation. The baleen and whale bone are just incidental to the whale meat itself. They must have killed thousands of whales to provide all the baleen and whale oil needed. It is a wonder there are any left. Thanks for this interesting post. 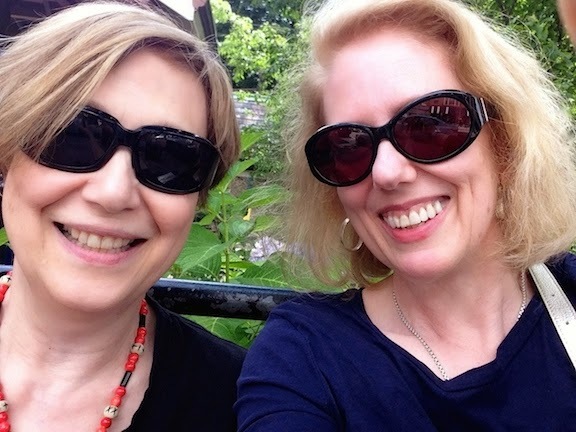 I would like to alert readers of this blog who are or will be in the New York of an underwear exhibit at the Fashion Institute of Technology. Here's a link with more about it. They did sometimes use whale bones (not to be confused with baleen) as busks. The New Bedford Whaling Museum has examples of scrimshaw busks. It's on my list of places to visit soon.